CANBERRA OPENS PUBLIC PURSE FOR PRIVATE HSR PLAN | COMMUNITY ACTION ALLIANCE FOR NSW (CAAN): HOUSING INEQUALITY WITH AUSSIES LOCKED OUT! Consolidated Land and Rail Australia (CLARA) a private company in July 2016 launched a $200 billion plan to build a high-speed rail link between Melbourne and Sydney with eight stops and plans for new regional cities along the route. CLARA’s board includes representatives from the public and private sectors in the United States, as well as former Australian premiers Steve Bracks and Barry O’Farrell and former trade minister Andrew Robb. DESPITE this the Turnbull Govt advances with the Western Sydney Airport proposal not satisfied with overdeveloping Sydney and Melbourne but to destroy our regions too! A consortium that said it would privately fund a fast rail line from Melbourne to Sydney will get a share of $20 million in public funding from the Turnbull government. Consolidated Land and Rail Australia, or CLARA, is a private company that claims it can build two inland cities in Victoria and a further six in New South Wales that are linked by high-speed rail lines between Melbourne, Sydney and Canberra. Their rail line would, CLARA’s plans say, be paid for by the company taking options to buy land in regional areas at a low price. The land would then be sold at a far higher price once a rail line was built nearby. The “uplift” in land value would provide billions of dollars in profit, CLARA’s directors say. 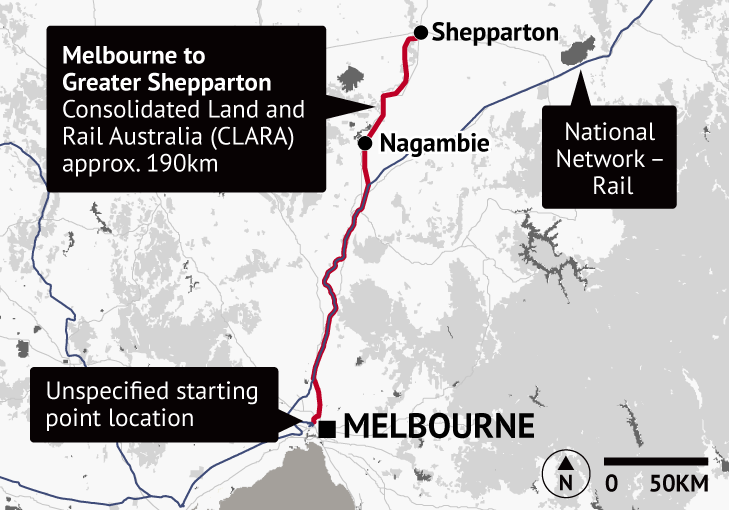 The rail line’s first stage would travel from Melbourne to Shepparton – a trip that CLARA claimed could be done in 30 minutes. The company has never revealed where its central Melbourne station would be built. The company has told the Turnbull government it can cut travel times from “approximately three hours”, though V/Line timetables show the fastest weekday service now is two and half hours. One of CLARA’s directors Nick Cleary is a former real estate agent from NSW’s Southern Highlands. When the project was launched in 2016, he said in a media release that “unlike other proposals for high-speed rail in the past, CLARA’s infrastructure can be paid for from the city development rather than from government coffers”. Government coffers will be opened to CLARA though, along with two other groups in New South Wales and Queensland, to help them write a business case. The funding has been granted under the Turnbull Government’s “$20 million Faster Rail Prospectus”, two federal ministers said in a joint press release issued on Friday. “In the Faster Rail Prospectus, the Turnbull Government stated that we wanted to look at both ‘evolutionary’ and ‘revolutionary’ proposals,” said Paul Fletcher, Cities Minister, and Michael McCormack, Infrastructure Minister and Deputy Prime Minister, in their statement. “The three proposals chosen for further development are at different points along this spectrum. One involves upgrades to existing track, another proposes entirely new track, and the third sees a mix. We have also ensured that three different transport corridors, in three different states, are being considered,” they said. Canberra granted CLARA funding for the new rail line’s business case without consulting the Victorian government. Public Transport Minister Jacinta Allan’s office was asked if the state government supported the project. “We’re focused on real projects, so the answer is no,” a spokeswoman replied. The spokeswoman said the government was providing more regional train services to Shepparton, would soon begin upgrading the rail line from Shepparton, and was also ready to start a “$1.57 billion Regional Rail Revival”. “We are still waiting for the federal government to release the funds that will allow us to upgrade every regional passenger line in the state,” she said. The fact sheet for the project released by the federal government said the CLARA proposal provided “an innovative and revolutionary model for building a high-speed rail link between Melbourne and Greater Shepparton that does not involve direct costs to government or taxpayers”. Mr Fletcher’s office has been asked how much public money CLARA will be given as part of the $20 million round of funding and where the rail line will begin from in Melbourne. His spokeswoman said she would respond on Friday afternoon. Clay Lucas is city editor for The Age. Clay has worked at The Age since 2005, covering state politics, urban affairs, transport, local government and workplace relations for The Age and Sunday Age.